I remember the first dinner I made for Ted— chicken fajitas with the Lawry spice package, flour tortillas and shredded cheese. I was 19 years old and while I had eaten, walked through and emptied the dishwasher in my Mom's kitchen, I hadn't ever cooked a full on dinner. I was so happy when Ted walked in the apartment that evening so many years ago and said, 'it smells good in here'. Looking back, I'm pretty sure that's where it started for me— the realization that cooking is more than eating, it's about creating space for nurturing and loving the people in our lives (even new boyfriends). That first fajita meal awakened my inner cookery maven but I still had a lot to learn. I wanted to stretch my fledgling culinary wings beyond fajitas and toasted tomatoes with provolone but didn't know where to start. 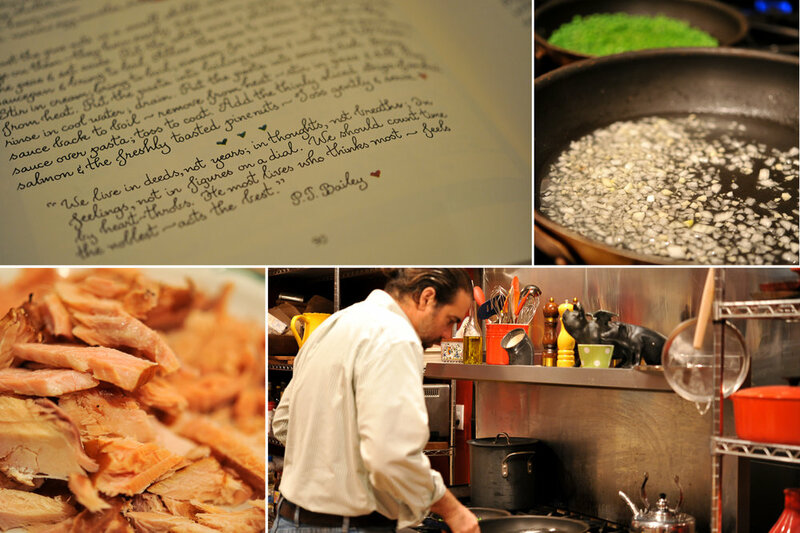 I was working at Ki Clayton in Southdale and we carried a couple of cookbooks by Susan Branch, I purchased them one afternoon and started planning my first 'real' meal made entirely from scratch. As it turns out, it was the best place to start— the recipes were easy, nearly foolproof and Susan lived in Martha's Vineyard (I've always a thing for Cape Cod). I lost the original cookbooks somewhere along the way (too many moves using the famous 'throw everything in black garbage bags and hope for the best' method). I found them this summer at a used book store and it was so good to turn those pages again. Looking through the cookbooks, I traveled back to the first time I made pesto, green bean salad with basil dip, ribs and cherry tomatoes stuffed with bacon and cream cheese. Food is truly my conduit to the past and memories I thought I had forgotten. Ted had a couple of signature dishes from Susan's cookbooks and this smoked salmon pasta was his pièce de résistance. I was not, and still am not, good at anything resembling mise en place. I prefer to cut, mince and measure as I go along my merry way making dinner, not the best method if you are sauteing anything. Thankfully, Ted is very good at the prep work and I tended to leave the recipes where you needed to have everything ready to go into the sauté pan in quick succession to him. He also makes a mean Kung Pao chicken but I'll leave that for another post. We were casting about for dinner ideas last week and as I was scanning the bookshelf, Susan's cookbook, Heart Of The Home, jumped out at me. I knew exactly what to eat for dinner and Ted was game to tackle the prep and execution of one of our favorite pasta dishes from our early years in Lowertown. It was as good as I remembered— smoky fish, white wine, shallots and pine nuts. It was nice to sit in the kitchen with a glass of wine, chatting with Ted and watching him cook. We have changed and grown in ways we couldn't have foreseen as a young couple but sitting in our kitchen, I realized it's everything I had hoped for and more. Toast the pine nuts in a small skillet with a tablespoon of butter. Set aside on a paper towel to drain. Cook the peas and set aside. Put the white wine and shallots together in a small saucepan and bring to a boil. Allow the wine to reduce by about a tablespoon. Stir in cream; bring to a boil and simmer for 5 - 6 minutes. Cover the pan and remove from heat. Put the pasta into boiling water and cook until al dente, rinse in cool water and drain. Put the pasta into a serving dish. 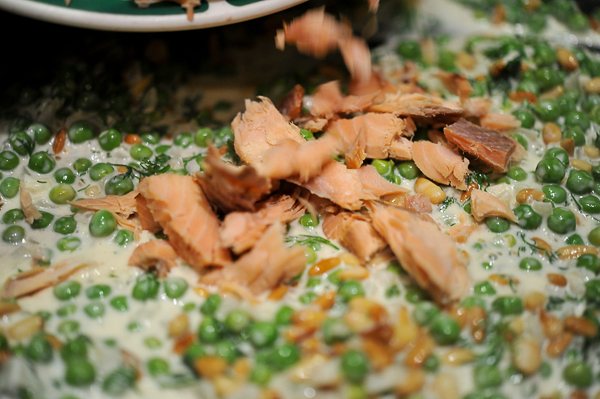 Bring the sauce back to a boil, remove from heat and add peas, dill, pine nuts and smoked salmon. Stir to combine and pour over pasta, toss to coat. Serve immediately.